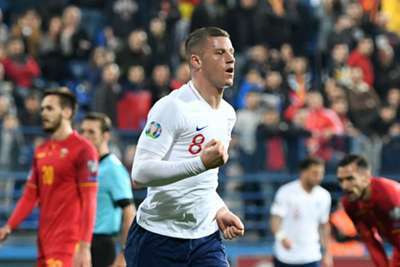 Two-goal Ross Barkley praised England's character after they came from behind to thrash Montenegro 5-1 in Podgorica on Monday. Marko Vesovic's well-taken opener had put the hosts ahead early on, but Barkley set up Michael Keane for the equaliser before scoring twice to put the game beyond their opponents. Harry Kane and Raheem Sterling added gloss to the scoreline late on and Barkley was impressed with how the Three Lions responded to the early setback to make it two wins from two in Euro 2020 qualifying Group A. "Montenegro was always going to be a hard test but we showed character to come back and put in a positive performance," he told ITV. "It was a great night for myself." Callum Hudson-Odoi, making his first start for Gareth Southgate's side, echoed Barkley's sentiments. "Hopefully I did well, it is not about me, it is a team performance," he said. "We had a great mentality from the start, going down was disappointing but we got back into it. "I reacted slow to the ball and they scored from it. We have to react positively and keep going."